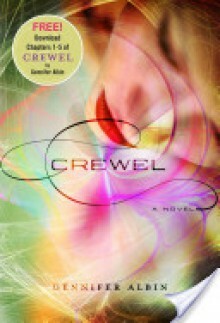 Download the first five chapters of CREWEL by Gennifer Albin! For generations, girls known as Spinsters have been called by Arras's Manipulation Services to work the looms and control what people eat, where they live, how many children they have, and even when they die. Gifted with the unusual ability to weave time with matter, sixteen-year-old Adelice Lewys is exactly what the Guild is looking for, and in the world of Arras, being chosen as a Spinster is everything a girl could want. It means privilege, eternal beauty, and being something other than a secretary. It also mean the power to embroider the fabric of life. But Adelice isn't interested. Because once you become a Spinster, there's no turning back. Buy CREWEL by Gennifer Albin October 16!